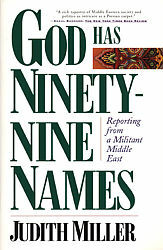 God Has Ninety-Nine Names is a gripping, authoritative account of the epic battle between modernity and militant Islam that is is reshaping the Middle East. Judith Miller, a reporter who has covered the Middle east for twenty years, takes us inside the militant Islamic movements in ten countries: Egypt, Saudi Arabia, Sudan, Algeria, Libya, Lebanon, Syria, Jordan, Isreal and Iran. She shows that just as there is no unified Arab world, so there is no single Islam: The movements are as different as the countries in which they are rooted. Vivid and comprehensive, Miller's first-and report reveals the meaning of the tumultuous events that will continue to affect the prospects for Arab-Isreali peace and the potential for terrorism worlwide.